Sporting holidays? Simple, with windsurf hire at Cala Ginepro! Windsurfing in Cala Ginepro, on the island of Sardinia, is a thrill-a-minute experience! This is a comprehensive discipline that involves mind and body working in harmony, and is a great way to make the most of a sporting vacation! Whether you’re an expert or a beginner, you can use the windsurf equipment hire service at Cala Ginepro to have some great fun in the sea. 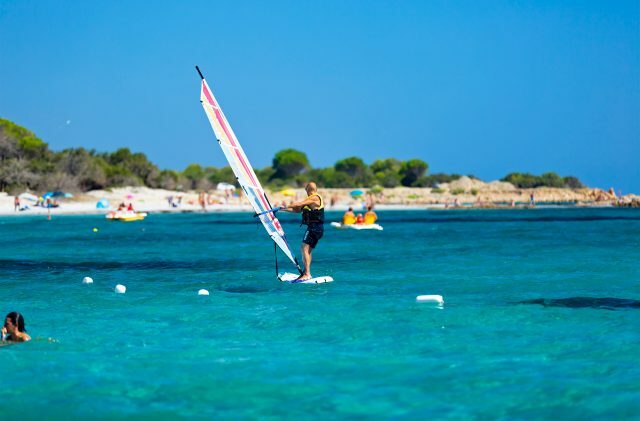 If you are unsure of how to approach windsurfing and you want to learn the basics, at Camping Cala Ginepro you can get to grips with this great sport thanks to the campsite’s entertainment team, who offer free courses during the summer. The initial experience of with windsurfing takes a lot of patience, but the excitement you feel once you have mastered the technique is unparalleled. Sardinia, with its almost 2,000 km of coast and unique mix of sun, sea and wind, is the ideal place for anyone with a passion for windsurfing. Thanks to its particular microclimate, the Gulf of Orosei is a magical place where you can learn how to windsurf like a pro. The often-windswept coast of Orosei offers a wealth of opportunities to have fun on your surfboard, amid the emerald green and turquoise shades of the sea near the shore, contrasting with the deep blue further out. For any information on the hire of windsurfing equipment, please contact the bathers’ assistants on Cala Ginepro beach. The service is available from 1 June to 30 September. Your sporting holidays in Sardinia await you at Camping Cala Ginepro, to experience a different side to the sea…combining sport, fun and freedom.